It&apos;s Spring! The flowers are blooming, the birds are singing and your house should get a fresh start too! To help you get a head start on the hectic seasons of spring and summer, we’ve compiled several tips for spring cleaning your humble abode. Now throw open the windows, take a deep breath, roll up your sleeves and get rid of the grime… Happy cleaning! Includes spring cleaning checklists and tutorials organized by room. Each section has a list of steps, tools and supplies needed, along with tips to help you get the job done right. This spring cleaning chore checklist will help you take care of important seasonal tasks around the house… inside and out! This printable checklist gives you an overview of everything you need to know when spring cleaning your home. Covers rooms individually and important tasks that must be done. Excerpted from "Martha Stewart&apos;s Homekeeping Handbook". Are you trying to go “green” with your spring cleaning? This site gives some fantastic tips for cleaning without chemicals and toxins. This article gives the pros and cons for helpful cleaners to have around the house. Read on to see which products will be helpful for your spring cleaning. This website will help you choose the right supplies, which products to avoid, green cleaning options, the best products for each chore, and real timesaving gadgets that will help in your home. 10 Common Spring Cleaning Mistakes… include ideas such as: 1) Waiting too long to clean, 2) Not having the right tools…, 3) Dusting first or vacuuming?, 4) Disposing of cleaners properly. And more! 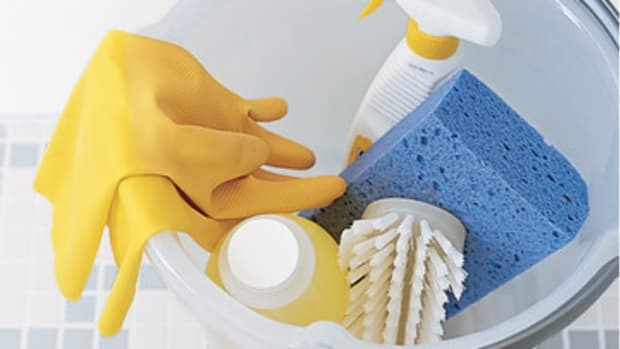 These five tricks will make your spring cleaning process more efficient and your home cleaner—you can thank them later! Are you or your kids sufferers of allergies? This free, downloadable guide covers the ABC’s of allergies & your family. It will help you plan playdates and spring clean your home for your kids without worrying about indoor allergens. This article gives some great tips to getting your kids off the couch and cleaning for spring! From bartering to games, this author gives some great ideas to bonding with your brood. Here are some great spring cleaning jobs for your kids… sweeping, dusting, moving things - whatever it takes to get them involved! Spring cleaning can be a family affair if you dust off your parenting skills and match kids with age-appropriate tasks. This articles breaks down chores by age group… giving you a great guide to getting your kids involved.